Complementing When Spring Comes (2016) and In the Middle of Fall (2017), a picture book that celebrates the winter season. In small bites of text that allow pauses for readers to savor the illustrations and to connect with their own winter recollections, this accomplished picture book details the season of winter. Henkes’ text is simple but evocative, observing winter in perceptive and sometimes-playful detail. Dronzek’s acrylic illustrations—presented in a variety of double-page spreads, spot illustrations, and single-page images—enrich and deepen the text as they add story details and warmth with their saturated colors and masterful line. An amusing series of spot illustrations punctuated with perfect text engages readers in the laborious chore of dressing for winter (“Boots and zippers / and vests and zippers / and jackets and zippers”). The opening double-page spread—a park in winter with people of various skin tones sledding, building a snowman, skating, talking, and walking their dogs—becomes the grounding point for the story. As the story meanders along (in a very good way), readers will recognize the pond, the house, the child from the opening illustration, which deepens the overall narrative. When, at the story’s end, winter becomes spring, the same park scene is shown but now with blooming cherry trees and green grass, and so the cyclic nature of the seasons is visually emphasized. 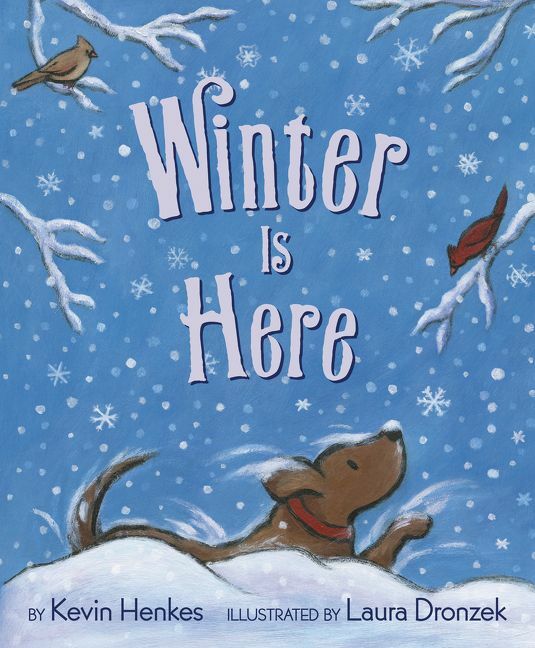 Winter is Here is part of the Children’s Picture Book Collection.